Andrew and I have been married for 3.5 years. I would in no way shape or form call myself a marriage expert on any day. But something I do think I am good at is showing my husband that I love him. 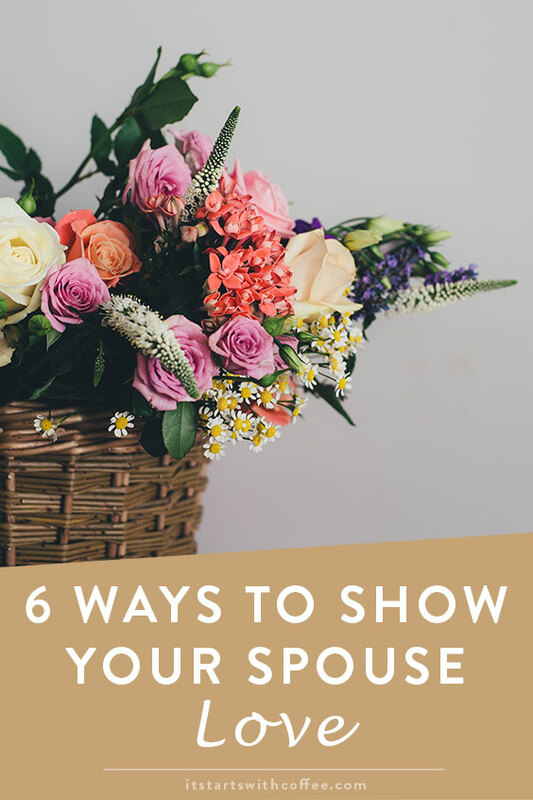 Today I am sharing 6 ways to show your spouse love. Leave Notes: Andrew started this for me early on and I picked up on it. We surprise each other with little post it notes on our mirrors, in shoes, laptops, on top of a container in the fridge etc. It’s a quick simple thing that takes hardly any time but really shows someone how much you care. Ask them what you can help them with: My love language is affection, but Andrew’s is acts of service. Asking your spouse how you can help them really shows that you are paying attention. Take an interest in their interests: Andrew and I have very different interests but we really try to take an interest in each others interests. Even if it’s listening to a podcast that they love with them, watching a show they like (even though you don’t). Even asking them about something they’ve been talking a lot about. Plan special things for them: It doesn’t need to be expensive or extravagant, but if your spouse loves fishing, plan a day to go fishing. Do they love wine? Find a local winery and spend a day there. Take something off their plate: Are they stressed at work and at home? Do something they normally do at home. For example unload the dishwasher, take the trashcans to the curb, pay the bills, etc. Show affection: This is the easiest, cheapest, and best thing you can do. Show your spouse affection. These days it’s really easy to get caught up on our phones, computers, and watching Netflix or DVR shows. Stop, get up, and give them a hug and kiss. Make sure you kiss them first thing when you walk in the door and last thing before bed. I hope you found these 6 ways to show your spouse love helpful. Would you add anything to the list? We both have pretty full plates so I imagine taking something off his plate would be much appreciated! A special night out or even day trip, walk or hike would also be pretty nice! Love the simplicity of this, and it is so true! I’m not married, but I do think all of these are great ways to show love!! These are such easy and grest tips, and they work! I’ve been married for going on 20 years, and I can say that your tips and suggestions are spot on! Thanks for sharing! I try so hard to remind myself to consider their love language too! Aww I love this list! I’m definitely going to try and do more of these things for my husband. Your website is beautiful! Great ideas. We are approaching our 20 year anniversary, and I find that we do this type of thing often. But I did need a little reminder today to unplug and share some love. Thanks. I’ve been picking up flowers at the store recently just because. They brighten the house and last for a couple weeks! I’m not married but when I am in a relationship. I tend to do all of these things. One I would ad is communication. While you can’t force someone to talk you can always verbally express that you are there, should they need to talk. These are great! I don’t have a spouse but think these can definitely be incorporated with friends, relatives, or roommates. Such somethings that can make a big difference in someones day! I have done a few of these and hope to plan a few more. They do work. These are all great ideas! I have been married almost 23 years and I leave post it notes around the house for my husband once or twice a week. Those are great ways to show love to your spouse. Once, I sent a single rose to my boyfriend at his office. Believe it or not, he loved that and talked about it to his friends! I’ve been married for 10 years and agree with all of them! Leaving notes is so easy and yet such a fun thing to do and showing affection is often forgotten but probably the best way to get a man’s attention!! My husband most enjoys when I just sit and watch t.v. with him in the evenings. Sometimes, it’s hard because I have so much I need to do. However, it’s important to our relationship, so that’s what we do. Great ideas! Every now and then I like to give my husband a little note and put in on his desk for him to find. I love leaving and receiving notes. Such a fun way to think about each other even when we aren’t around that part of the day. Great tips! I love these little gestures for your spouse. I leave notes for my hubby all the time. And I love when he does the same for me! I absolutely adore this post. Too often anymore, people get stuck on themselves and need to realize they’re supposed to support their spouse in every way. This is really great advice! I think it’s really important that we are always showing our significant others how much we care. These are really good tips! And they can easily be integrated into everyday moments with your spouse! It’s so important to let the other person know they are loved. Even though we are super busy, we simply make an effort to take time to talk and spend time together each night, separate from the kids. Even if it’s just on the couch watching TV. These are really good tips to remember it’s so important to keep our spouses “love tanks” full. My husband and I both haves different love languages, like you’ve mentioned. It was a big ah ha moment when I realized we needed to reach each other with their method. I love this. Reminds me of the 5 love languages!